Terry Wogan's Radio 2 programme is one of the most popular radio programmes in the country and it's Pause for Thought feature provides listeners with reflections which are often challenging, topical, thought provoking but always inspiring. The popularity of this feature was emphasised by it's huge audience feed back and the wonderful sales experienced by the first collection of 'Pauses'. This second collection makes a delightful treat for the regular listener and an inspiring gift for anyone, whether they are fans of the programme or not. With an introduction by Terry Wogan this book is truly another treasure chest of inspiration. - Publisher This book is bound to offer inspiration and enjoyment to the tens of thousands of people who bought the original Pause for Thought or who listen to the programme on Radio 2. They will be equally delighted to know that Terry Wogan again applies his unique style to the introduction. 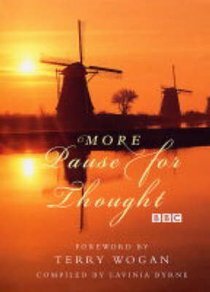 About "More Pause For Thought"
This book is bound to offer inspiration and enjoyment to the tens of thousands of people who bought the original Pause for Thought or who listen to the programme on Radio 2. They will be equally delighted to know that Terry Wogan again applies his unique style to the introduction. Lavinia Byrne was a Sister of the Institute of the Blessed Virgin Mary, a Roman Catholic Order, until she left in January 2000. She continues to teach at Westcott House Theological College, Cambridge. She is a regular broadcaster on Radio 4's Thought for the Day and author of a number of books.